Caroline has my car and Alexandra has my house. Let me elaborate on that. Caroline’s car won’t be repaired until Tuesday so she has my van. Alexandra is having a retreat with 18 fellow students in my house to write the show she is producing this October at her college. So where does that leave me? 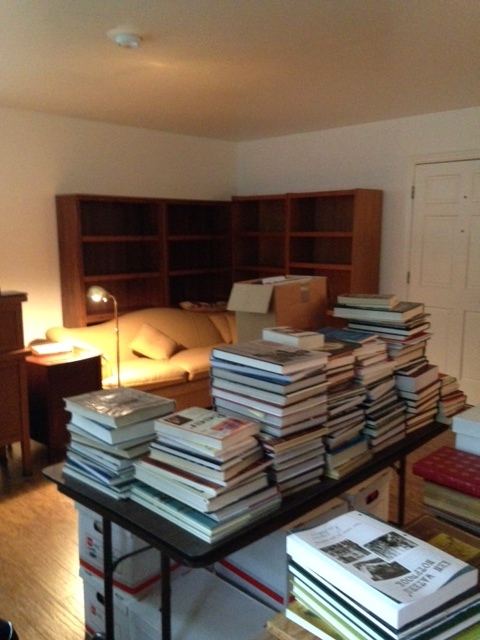 In the apartment over the shop, which is full of books ready for sorting in the bookcase, with the big red pick-up for transportation and lots of time to read. Three months ago today I left for Spain to walk the Camino. I miss it terribly. I’ve spent the weekend reading Wild by Cheryl Strayed. It is her account of walking the Pacific Crest Trail, a much, much harder version of the Camino but so many of the emotions and experiences are the same. Although you don’t carry many material goods on these types of expeditions, your heart accumulates a lot and I’ve barely begun unpacking. Cheryl had been back 18 years before her book was published. Since I’ve been back I’ve spent 10 days in Florida and 12 days Minnesota at my Mother’s 80th birthday celebration. I was able to find a new strength somewhere deep to stand-up for myself in a way I had never done before. I gave a lecture and a power-point presentation, never did that before either. After only one change of clothes for weeks Alexandra and I have been happy with far fewer clothes and we each lived out of a small suitcase the rest of the summer. I’ve sorted out rooms and rooms of my mother-on-law’s possessions, splitting them with my sister-in-law and finding new homes for the leftovers. It has been a monumental task, as my mother-in-law lived to accumulate after the great deprivations of childhood. But now I have finally found my basement and garage. Most importantly I’ve sat at the pool. For the last 15 years I’ve belonged to a little neighborhood pool. It was built in the 1970’s and is old and tired but I don’t have to clean it and many days I have it to myself. If it was fancier or in an exotic locale I wouldn’t be happier, my happiness quotient is filled by this spot on earth. I spent many delightful summers with my girls swimming and eating pizza by this pool. Now I go by myself and read, drink iced coffee and float. That pool has received so many of my emotions the last few years and this year it has accepted many new ones. 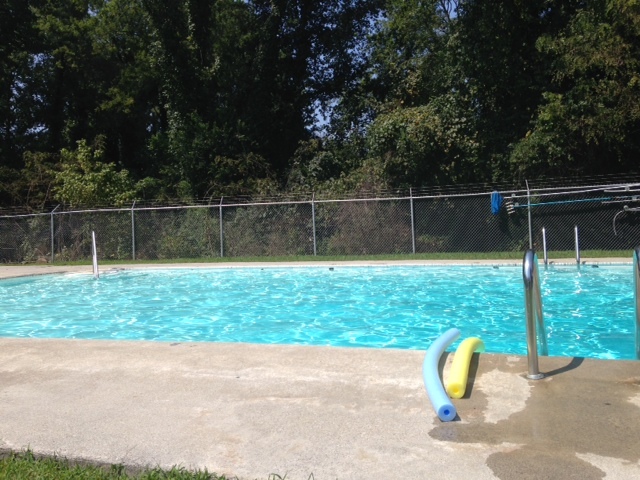 Thursday was one of the saddest days of the year for me, the last day I could go to the pool for the season. As I head in to autumn, the most magical months in East Tennessee I hope to leave the summer busyness behind. I asked the Camino to open doors and it has, and will continue and I am ready. In the mean time I hope to do one of my other favorite things besides float in a pool—watch leaves fall. The summer of 2014 will be in my heart forever. This entry was posted in Books, Camino by theperpetualpilgrim. Bookmark the permalink.